If UFOs are not extra-terrestrial spacecraft what are they? The product of our collective imagination? Many psychologists have speculated on the topic. Carl Jung is one of the founders of modern psychology. Unlike many of his scientific colleagues, he openly expressed his fascination with the paranormal, discussing esoteric phenomena, including UFOs, in many of his writings. Jung’s work in the field of dream analysis led him to a profound study of symbols. He found that many symbols were common across different cultures, even those which had had no connection with one another. This curious phenomenon caused Jung to develop the concept of the “archetype” – a symbol which is expressive of some deep need within the human psyche or what Jung called the “collective unconscious”. One of these archetypes was the mandala, the circular symbol of wholeness. When UFO mania developed in the post- Second World War period, Jung interpreted it in psychological terms. The UFOs to him were mandalas, archetypal symbols of wholeness which a frightened populace imagined in a pseudo-religious yearning for redemption. To Jung, this worldwide projection of an inner psychological need onto an external form was indicative of some tremendous change underway in humanity. He speculated that it heralded the onset of a new astrological age - the age of Aquarius. It is certainly striking that the onset of the UFO phenomenon coincided with the arrival of the Cold War and the fears it generated. When the Soviet Union developed nuclear weapons in 1949, for the first time it seemed that humankind might bring about its own destruction. Curiously, UFO flaps have often coincided with periods of crisis in a nation’s life. For example, in the late 1990s, while Serbia was being targeted by international sanctions and faced the threat of military attack, the number of UFO sightings in the country shot through the roof. In the economic chaos in Russia which followed the ending of the Cold War, yet again UFO reports came in thick and fast. These are certainly consistent with Jung’s theory that the image of the flying saucer represents the longing for safety and wholeness of a people living through chaos and fear. Of course, other explanations are also compatible with the same set of facts. If there really are aliens visiting us, they may well be concerned about any threat we may pose to them or to each other. Monitoring our military capabilities, places which may soon be the scene of military action or chaos-ridden countries which continue to wield great military power, would also make sense from this perspective. 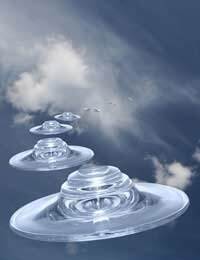 To the uninitiated, the reports of abduction by aliens are the part of UFO research which most obviously cries out for a psychological explanation. Those who claim to be victims of alien abduction often have no conscious memory of it at first. Typically, memories of the experience are only recovered under hypnosis. A common feature of the abduction account is some kind of sexual manipulation by the aliens. These two characteristics – sexual manipulation and the recovery of repressed memories through hypnosis – are also associated with the phenomenon of childhood sexual abuse. This has led some to speculate that “alien abductees” are really victims of sexual abuse during childhood. Because the abuse may have been perpetrated by a parent or trusted elder for whom the child felt deep affection, it may be difficult for the victim, now fully mature, to properly acknowledge it. Projecting the abuse onto an external imaginary entity, such as the aliens, may be a way of reconciling the reality of childhood abuse with a continuing affection for its real perpetrators. Interestingly, one highly respected psychiatrist who looked into the alien abduction phenomenon, John Mack, reached exactly the opposite conclusion, however. He came to believe that some “memories” of abuse by parents were being invented by people who, in reality, were being kidnapped by aliens. The idea that they were being abused by aliens was hard to accept, however, so they projected the abuse onto their parents instead! Susan Clancy is another Harvard psychologist who has researched what has come to be called “False Memory Syndrome” – the apparent recovery of memories under hypnosis which, in truth, are not memories at all but fictional creations. Clancy believes that many supposed alien abductees are simply people who have suffered from sleep paralysis. Sleep paralysis is a perfectly normal lockdown of the body’s movement functions which occurs while we are dreaming. Sometimes, however, it persists into the waking state. This means that people are awake but unable to move. As a result, Clancy believes, they may hallucinate things – in effect continuing to dream while awake - in order to conjure up explanations for the strange state they find themselves in. Certainly, the motif of being restrained and unable to move features in many alien abductee accounts. That aliens are chosen as the imaginary perpetrators of the evil act relates to their pervasive presence in pop culture fiction, according to Clancy, as well as to the existence of sympathetic “alien-friendly” psychologists who coax abduction narratives out of their all-too-willing patients. There is no doubt that UFOs are an extraordinary phenomenon of some sort. Either they are real and so deserving of serious scientific study; or they are a collective fiction which the human race has generated for itself - in which case they are deserving of serious scientific study too.